Happy Thursday! 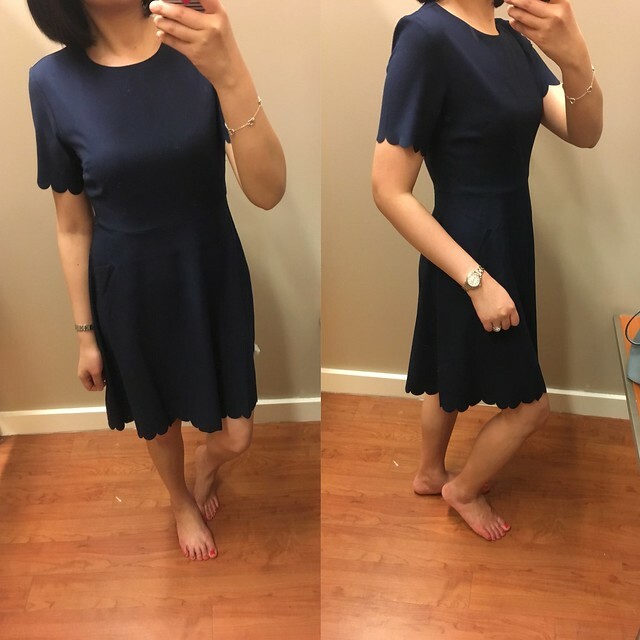 Last weekend I popped into Banana Republic Factory on a whim and I found this white scallop trim top and fit & flare dress (reviewed at the end of this post). Both items fit true to size and I love the fit and quality of both pieces. The white scallop top isn’t see through and I adore the scallop details on the sleeves. 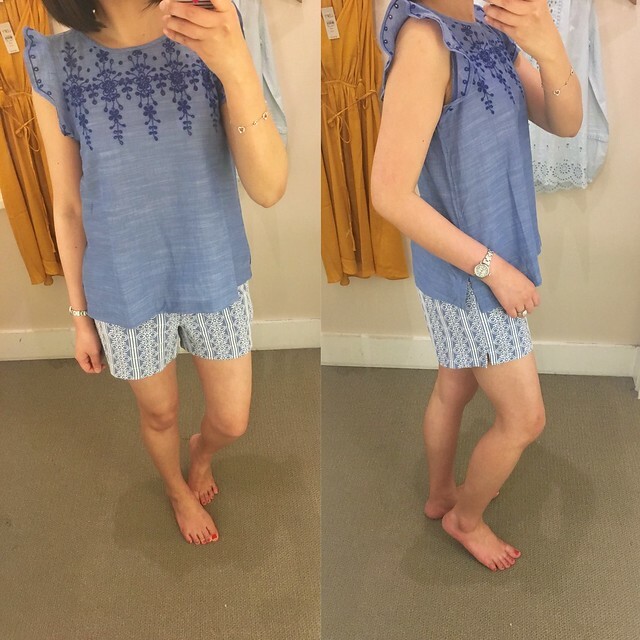 I also picked up these beautiful embroidered shorts at LOFT since I love the color and scroll details. This daydream cami is a new arrival that also has the same eye catching embroidered details. I was at Fanueil Hall so I also stopped by Abercrombie lured in by a sign for shorts on sale as it were. I snagged this soft oversize cardigan which was on sale for $35 (now $28.80) and a new pair of white cut off shorts for about $29 (they’re now $23.20). Refer to this clip to see the above outfit on me. Clearly I’ve been missing out on some cute things at Abercrombie. I also love these denim overalls and tried on size S which was too big and loose so I believe I need size XS (size XXS is currently sold out). I also saw this pretty cold shoulder floral print maxi dress which looked a bit long but I see that it’s available in petites online. I tried on this ruffle top with the shorts and I loved the combination so much I took both pieces home. The top runs about one size bigger since I had to size down to size XXSP. The shorts fit true to size in my usual size 00 regular. Refer to this clip to see the outfit on me. 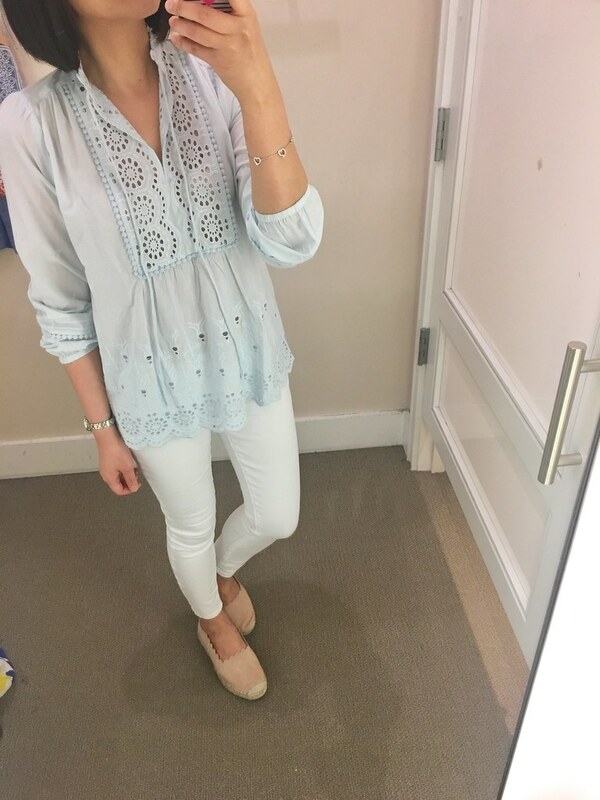 I wanted this light blue eyelet blouse when I first spotted it online but I wasn’t sure which size I needed so I was glad to find it in petites in store. 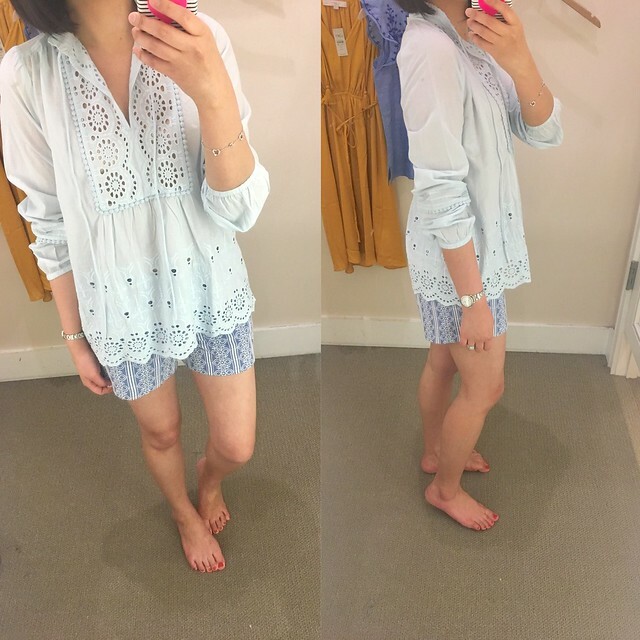 I tried on size XSP which fits true to size for a relaxed fit. I don’t like the long sleeves and prefer them pushed up. The elastic can be bothersome for some but they help to keep the sleeves in place. The material isn’t sheer but I wore a cami due to the small cutouts in the eyelet detail. 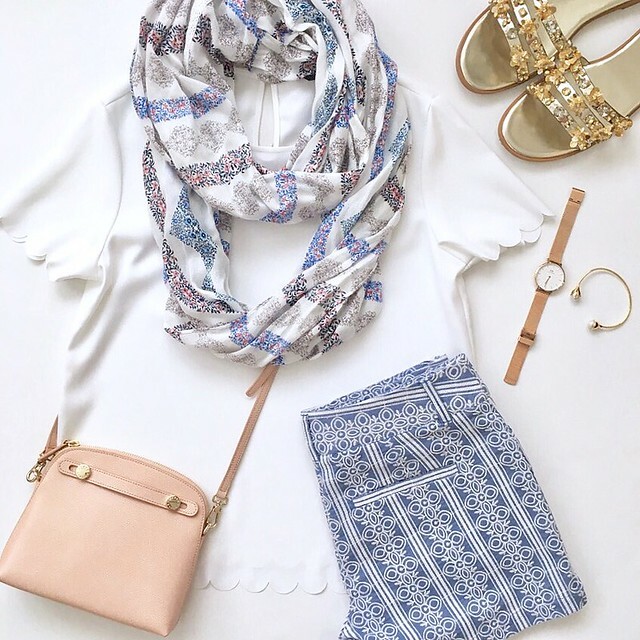 I also love how this shirt looks with white denim as shown below. My fit twin Su @allaboutloft recommended this gorgeous medallion skirt and my local store finally carried it in petites. Size 0P fits me true to size but it is shorter than I would normally prefer. 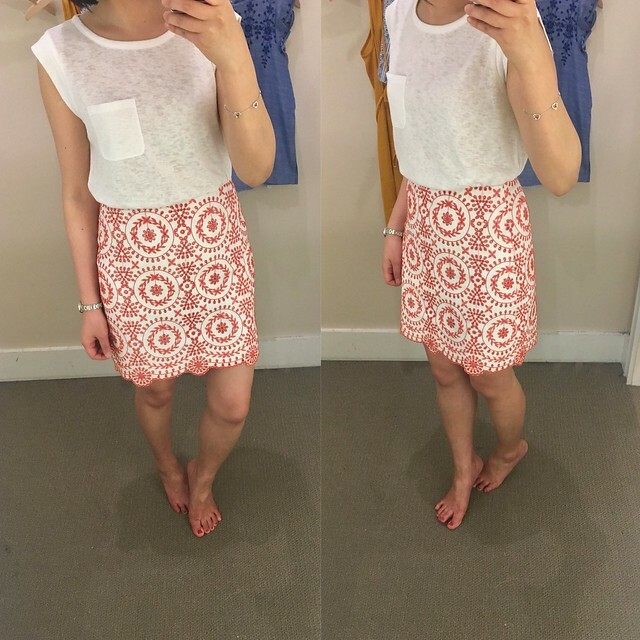 I took home size 0P but would love to try size 00 or 0 regular for comparison. Su ordered both 00 and 0 regular and she noticed that size 0 fit smaller than size 00 for whatever reason. The smaller regular missy sizes were sold out at my store last I checked. I love the beautiful golden color of this dress tie waist dress. The tassels remind me of a graduation gown. Size XSP fit me true to size hitting right at my knees. The dress is unlined but the silky polyester material didn’t appear to be too thin. In person I felt that the bust was too loose on me so I passed on this dress but it should be very flattering as long as the color compliments your skintone. 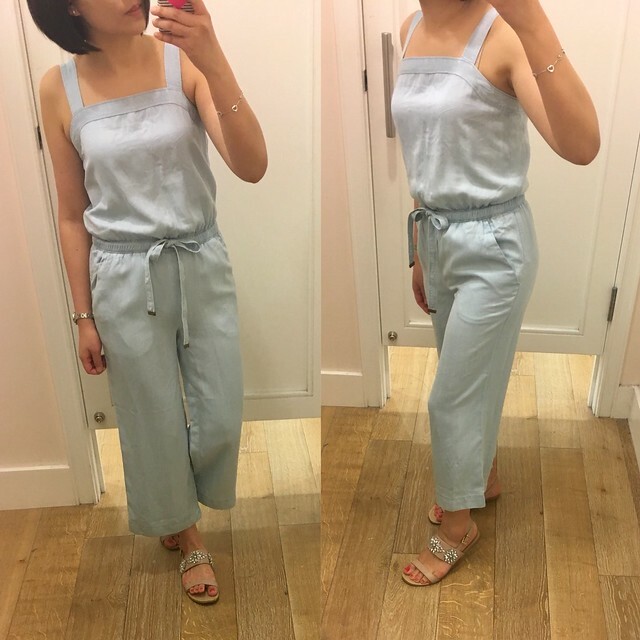 I also tried on this chambray jumpsuit which was on my wishlist. Size XXSP fits like size XSP. The fit of the chambray version is better than the striped jumpsuit I reviewed here. The straps are shorter so the top portion fit me well but the hips were a bit snug especially across my backside. However, I was afraid that my usual size XSP would be too loose and unflattering. Refer to this clip for another view of the fit on me. As mentioned above I loved the fit of this fit & flare dress from Banana Republic Factory and size 0P fits true to size. Banana Republic Factory runs bigger since I’m usually size 2P at regular Banana Republic. It’s the perfect work dress and I love the added interest of the scallop details on the sleeves and along the hem. I wish it came in other colors since it’s the perfect cut and style. 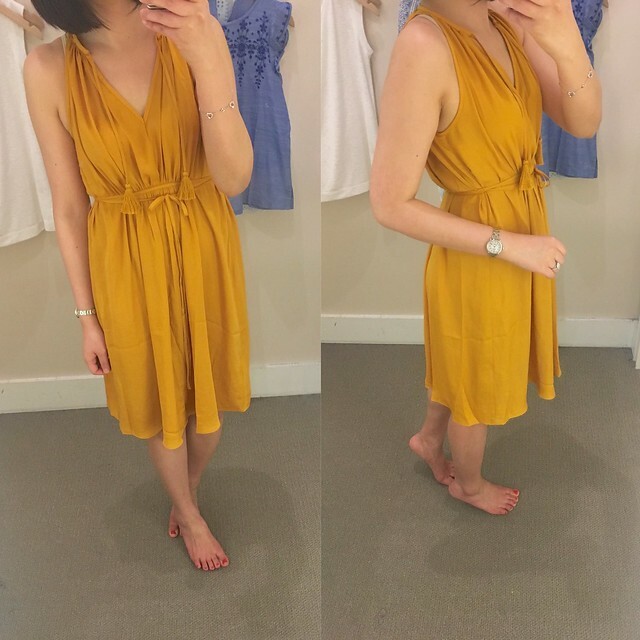 I’ll be sure to stop by more frequently if it means finding gems like this dress and the top featured at the beginning of this post.